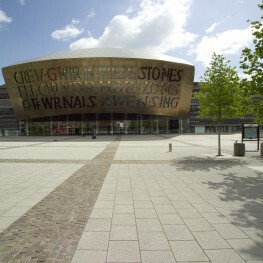 Wales Millennium Centre is Wales’ national home for the performing arts in Cardiff Bay. 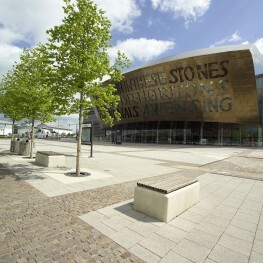 One of the UK’s top cultural attractions and home to eight resident partners, this Welsh landmark stages musicals, opera, ballet, circus and contemporary dance. Collaborating with Capita’s architects we worked to create a destination at the end of Lloyd George Way whilst ensuring the new building co-ordinates with the Welsh Assembly Building. Inspired by the Pembrokeshire slate cliffs, the building rises from the dockside and the hard landscape responds to the design by the use of natural stone paving in a simple but bold layout. 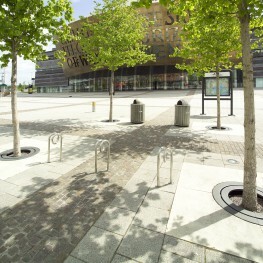 Our design links the Millennium Centre to the newly formed Oval Basin to create an important public space and performance area. Works of art were commissioned and integrated into the public realm. The project was a culmination of many years of design and co-ordination with teams on adjacent sites.